Finally, a new release! After living out of a suitcase for a few months, I'm moved into a new office. We still don't have broadband connected, and we're reliant on a 3G connection to upload new versions of bliss, but it works! Being the total of three-odd months of work, this is a big release with many changes. The main visible improvements are in the tag editor and the cover art alternatives page. The tag editor has been changed to use a different user-interface component. We now use something called SlickGrid. I feel this gives a much snappier experience and implements far more natural keyboard navigation. Furthermore, simply clicking away from a cell now saves the value, rather than having to press [enter], which wasn't obvious before. There's also an undo button to reverse previous changes. The <tracknumber> token used in the default file organisation patterns has been changed. Now, we use <tracknumber:auto> rather than the "raw" value, to make it more widely applicable and to provide an ordered track list in all players by default. Existing use of the default patterns will remain the same, although your pattern will now be counted as a "custom" pattern in the settings user interface. I also added an extra piece of work to clean up empty folders after moving. If there's a thumbs.db file in a parent folder, that is removed. This way, old "artist" folders containing multiple albums will also be pruned when there are no child folders anymore. First, a couple of changes to the rescan and "play and pause" buttons. If the music folder doesn't currently exist when rescan is pressed (e.g. it's a mounted volume and hasn't been mounted yet), an error is displayed. In addition, if rescan is pressed after the folder has re-appeared, the play and pause buttons are now re-enabled. One for Synology users: on file updates, @eaDir folders are now ignored. They were ignored before on initial scan, but not on update. When scanning music files, the YEAR tag is now parsed to extract the year information, in cases where it's a more detailed timestamp. Finally, I've implemented an improvement to make sure bliss can handle very large folders (with, for example, over 32,000 files in one folder). 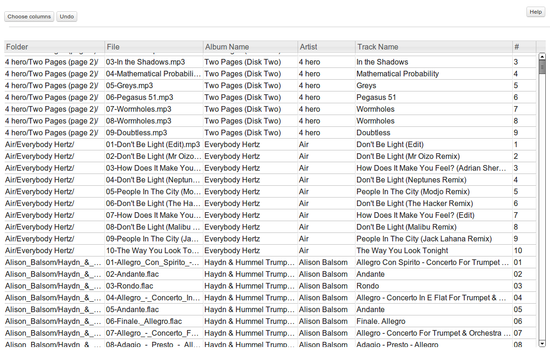 Errors that occur when editing metadata on the album detail page now appear in a popup. In addition two further bug fixes: a bug which meant the text "unset" were saved into tags; and another bug which meant the album list filter was not re-established correctly on returning to the album list, were both fixed. I've made genre consolidation and the missing genre rule work better together. Now, if a genre is missing and the genre consolidation rule is enabled, you'll be given a choice of genres to populate from your allowed list, even if a genre cannot be found online. The genre matching, which chooses an appropriate genre in your 'allowed' list given an input genre, now also performs substring matching to find appropriate genres to replace. Finally I also fixed a UI bug in the settings interface where the 'remove' button on the allowed genre list was incorrectly labelled. A few smaller tweaks in this area: long image URLs are now cached properly on Linux, the singular embedded artwork rule now tolerates corrupt artwork and the pencil icon to change cover art is disabled if the cover art rule is disabled. You can download the release from the downloads page. After you click through, installation instructions are available on the page following download. Existing users can use the in-app updater. You can also download the latest installer and install it, replacing the current installation. Any fixes licences already purchased will be retained! Thanks to One Way Stock for the image above.